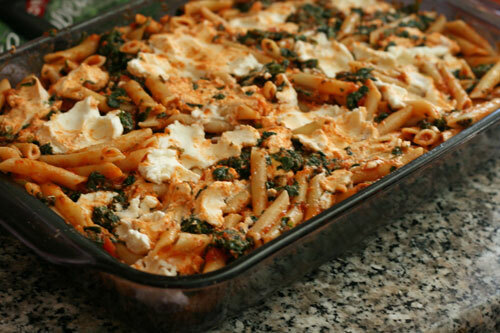 Spinach Baked Ziti combines ziti with marinara, spinach, ricotta and mozzarella for a delicious and hearty pasta dinner. 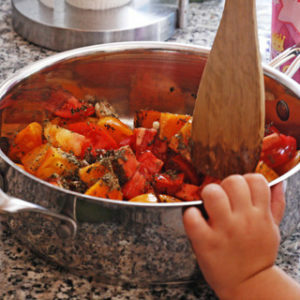 Perfect for cooking with kids! Will spends so much time in the kitchen with me that sometimes it’s hard to decide what to talk about on Mondays. Sweets are always a favorite (for me, you, him …) but I love knowing that he’s learning to cook while we are cooking together is really special. Dishes like this one are things that aren’t just a treat — they represent a life skill. He could feed himself as an adult with this. I’m on a bit of a spinach kick here. Last week I made a big spinach lasagna when friends visited. This week? 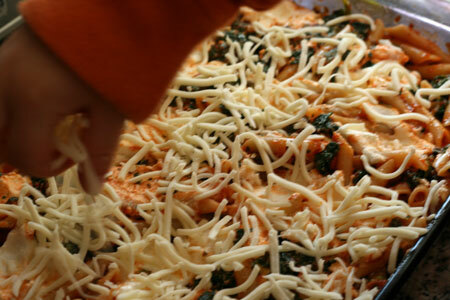 Spinach Baked Ziti … and this one is totally a kid-cook-friendly dish. Unlike lasagna, which requires some amount of precision (have you spread that ricotta mixture on noodles lately? It’s tricky! ), ziti is more hang by the seat of your pants. Being forgiving is a big plus. For Will‘s part, he really did the majority of the work here. I cooked the pasta and drained it. He mixed, stirred and poured (while I held the bowl, of course). I took care of the ricotta process, then turned it back to him for the final layer of cheese (mozzarella). Of course, I did the baking … but this was largely Will’s dish, something that he excitedly mentioned over dinner. 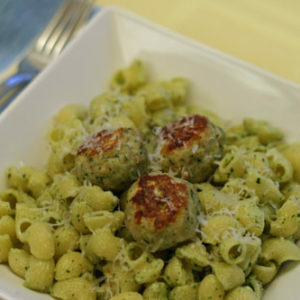 This hearty pasta dish makes a wonderful dinner for the chillier nights of the year. For added sauciness, you could also add a can of diced tomatoes (in their juices) to this recipe. Spray a 9×13-inch with cooking oil spray. 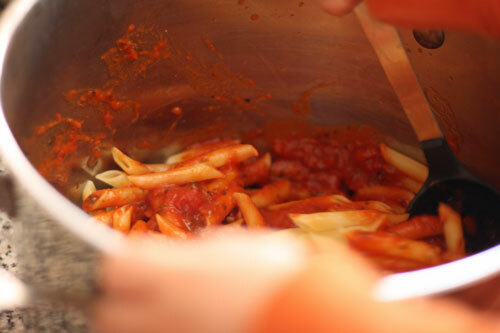 In a large bowl, combine the penne and marinara sauce. Gently break apart large pieces of spinach (before opening the bag) and then pour contents into the bowl. Stir again. Pour the mixture into the prepared pan and spread out. Dot with half of the ricotta. Stir in gently. Dot with the other half of the ricotta and press into the pan. Spread the mozzarella on top. 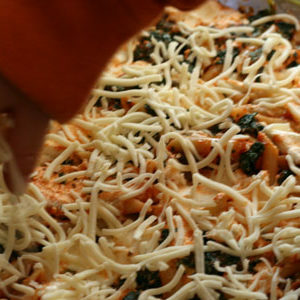 To Cook: Bake in an oven preheated to 375 for 30 minutes, until mozzarella is melted and the edges are lightly browned. This can be made up to a day in advance and stored, tightly covered, in the refrigerator. Let sit at room temperature for 30 minutes before cooking. Baked ziti is something I haven’t tried yet. I love that it’s meatless and you used spinach instead. It’s something that I could definitely try! Bookmarked! .-= Sook @ My Fabulous Recipes´s last blog ..Baked Salmon with Garlic and Basil =-. 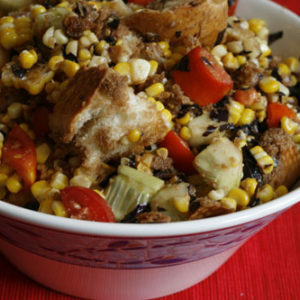 Mmmm, perfect dish for this weather – yum! .-= Cate O’Malley´s last blog ..Sleepover Food: Rainbow Pancakes =-. Good job Will! He is going to have such an advantage when he leaves home! Can’t wait!! It’s in the oven! Love Ziti, thanks for putting that twist on it!